Description: The quilt shown was made by the members of the Colfax Junction Quilters for their annual fund-raising drawing. Full-size paper patterns and instructions will use or develop your skills in piecing, paper piecing, and applique with optional embroidery and embellishments. The patterns are packaged in a reusable plastic envelope for easy storage.The blocks range in size from 2" squares (filler pieces) to 8" x 10" blocks. 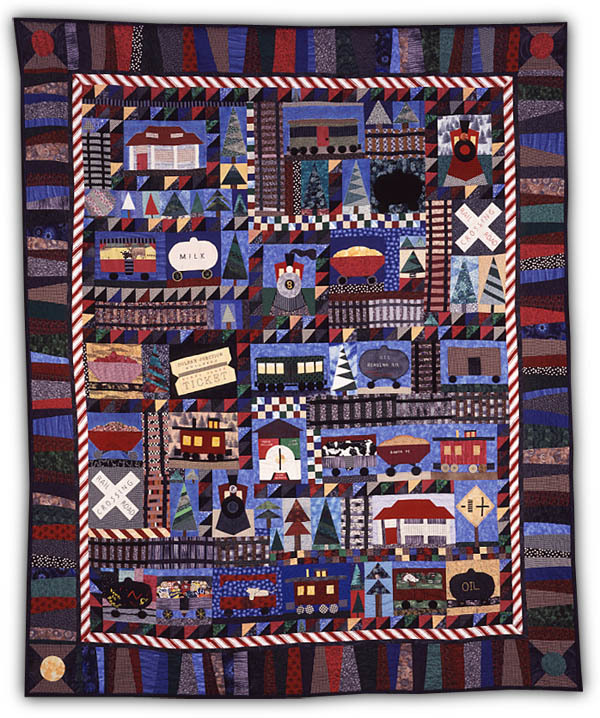 Included are instructions for: Railroad Crossing, Tracks, Depot, Block Instrument, Train Ticket, Trees, Open and Closed Freight Cars, Wagon and Tank Cars, Caboose, Colfax Chamber of Commerce Car (vintage passenger car), Locomotive, Filler Pieces?plus suggestions for assembling your quilt.